Learn how to carve a spoon using three basic, old school tools: axe, knife and hook knife. - hopefully the inspiration to carve more! Important: This is a 2- session class. Session one will familiarize everyone with the tools and materials, and prepare the spoon blank out of soft Alaskan Yellow Cedar. After a week's break, when we have had time to think about our own personal design, we'll carve the spoon in session two and try working with some harder woods. The techniques used apply to greenwood carving. Inka chooses to teach with seasoned softwood because she doesn't want to fell a tree for every class. She likes to work with found greenwood. You will easily be able to use the same techniques on any greenwood you can find. Inka is a boat builder and cabinet maker initially trained in Germany. Her interest in traditional wooden boat building brought her to indigenous craft, oar making and paddle carving. 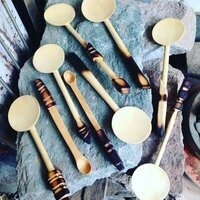 Since there is no way to store hundreds of paddles, she started carving spoons, using cutoffs from work. She now is carving spoons with a passion previously unknown to her, studying their use and function. It's crazy fun and very satisfying. With an education in both, woodworking and fine arts, she is constantly working on passing on her knowledge while making a living, creating community, and exploring expressive opportunities.